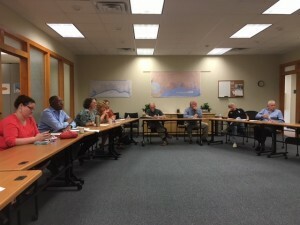 The Working Group has been formed to evaluate the Mississippi Gulf Coast’s rail corridors. This group will be our region’s technical team discussing development needs and improvement opportunities across the three coastal counties. The group may decide to address several issues related to our rail corridors and sub-committees may be formed to research and focus on specific topic areas. Meetings will be called as the group decides they are needed. In light of several recent rail incidents across the Gulf Coast, in particular, the Tour Bus Crash in Biloxi that killed four tourists, rail crossing safety has again been brought to the forefront of discussion. It was timely that the Rail Corridor Working Group met on March 30th, 2017 to follow up with the local jurisdictions on their concerns for safety, access and possible closure opportunities. MDOT, FHWA and CSX all participated in the discussion. The top priority for all agencies is to complete a border, to border crossing evaluation that focuses on condition as well as noting what safety features are currently present and installed. 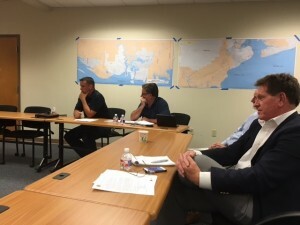 MDOT rail planner, Josh Stubbs, is spending significant time on the Gulf Coast right now meeting with each jurisdiction to discuss their needs and top concerns, as well as to coordinate the evaluation of their crossings. He hopes to have all evaluations completed by the end of April and will provide to the jurisdictions and a copy to the MPO, all of the recommendations for improvement at each crossing location. At our meeting, Josh provided a handout that showed proper signage and striping distribution at and near rail crossings. He stated that elevation, paving and even some striping projects could take time and potentially significant funds to get installed. Making sure that the signage at each crossing though, is relatively low cost and can be implemented very quickly. That is the priority. To identify what sign improvements are needed, provide the list to the local city or county staff, MDOT will assist with sign creation as they are able to, and the jurisdictions will need to install signs properly, according to the guidance provided to them in the letter from Josh. Some of the larger jurisdictions on the Coast have their own sign shops, and noted that some discussion can occur between mayors/city manager to share resources, to get this sign installation program underway and completed as soon as possible. MDOT will let us know what assistance they can offer, then a discussion with the locals to try and fill in the gaps will be coordinated by the MPO as needed. The MPO staff provided a crossing evaluation worksheet that discusses the many aspects of a crossing to be reviewed during a field review. It focuses on conditions but provides a good overview of how the local staff can continue to evaluate their facilities in the future. 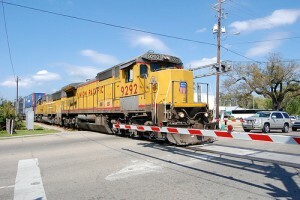 The MPO, in addition to helping where needed as the crossing evaluations get underway, will also be completing traffic counts for each CSX crossing throughout the month of April, will continue to monitor rail planning and progress of the Southern Rail Commission and efforts to restore passenger service as it proceeds at the federal level. All LPAs are asked to coordinate a time to meet with Josh Stubbs about their crossing prior to Friday April 7th by email to jstubbs@mdot.state.ms.us and phone 769-218-6542. Photo 1:Members of the Rail Corridor Working Group. Photo 2: Jacob Smith and Stephen Curlee, CSX, (on left) discuss rail safety and maintenacne with working group.